The former Scotland and Rangers great proved that he was still a force to be reckoned with during a memorable Scottish Cup final. It was billed in the media as the battle of the "Brothers Grim" between Tommy and Jim McLean when Motherwell confronted Dundee United in the 1991 Scottish Cup final. But what turned into a afternoon of rich entertainment, with the Steelemen eventually prevailing 4-3, also provided the sport's aficionados an opportunity to applaud the myriad skills of Davie Cooper, one of the most mesmerising talents ever to grace the game in his homeland. 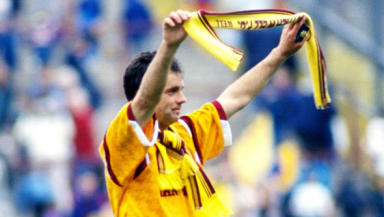 There were many observers inclined to dismiss Cooper as a washed-up performer when he signed for Motherwell from Rangers, at the age of 33, in 1989, for the bargain-basement price of £50,000. Yet the internationalist not merely inspired his younger team mates, but responded to his new challenge with such verve and va-va-voom that Scotland came calling again for the maestro. Tom Boyd was one of the 'Well youngsters who felt honoured to refine his technique in the inimitable Cooper's company. "When Davie walked through the door at Fir Park, it was a real coup for us," recalls Boyd. "Straight from the outset, his attitude was first-rate, he talked to every member of the squad and told us he wanted to make a genuine impression at his new club. "It was as if Davie found a new lease of life and I was delighted I got the chance to play with him, because you could see at close quarters how much class he had. "The move was good for Davie, too. It meant he could use his qualities of ball control, vision and ability at set pieces, to benefit those around him and the younger guys in the team were able to latch on to his servicce and use their pace. I learned an awful lot from him and the 1991 Scottish Cup win was one of those unforgettable experiences where everything comes together for a small club and nobody talks about the Old Firm for a few days. "Some people might have imagined that Davie was simply running down the clock when he left Rangers, but he proved them all wrong in the years ahead." The reality was that Cooper was in love with football, it was the one stage where this normally unassuming fellow could swagger in the spotlight, and he was absolutely determined to ensure that Motherwell would profit from his powers. Therefore, all the pre-match pomp and ceremony washed over his head. Whatever the sentimental tone of much of the coverage in the days leading up to the Cup final, he realised that these afternoons were bound to become increasingly rare and that he had better grasp the opportunity as if it was a winning lottery ticket. In the back of his mind, he was also slightly apologetic about having booked his place at Hampden after missing the previous round's victory over Celtic through suspension. “Some of the lads who have missed out will be gutted and I can sympathise with them 100 oer cent”. But, once the match commenced, there was no time for the participants to fret over side issues. Dundee United were, of course, the bookies’ favourites and deservedly so. They were an organisation which, in the recent past, had snaffled domestic trophies, reached the UEFA Cup final and had progressed to the semi-finals of the European Cup. They started with the confidence of a club which had jousted with giants and it was all that Motherwell could do to repel their early onslaught. A Hamish French “goal” was chalked off by the narrowest of margins, prior to a Freddy van der Hoorn shot rebounding off the post and rolling, agonisingly for the Tannadice man, along the goal line. Yet, much as they had done throughout the tournament, McLean’s personnel weathered the storm and, as Cooper began to weave a mazy path through his opponents, chances arrived for the underdogs. Chris McCart nearly broke the deadlock, but shortly afterwards, Iain Ferguson linked superbly with Jim Griffin and the former’s coruscating header pushed his side in front. It had already been a thoroughly entertaining contest, yet there was little indication at the interval of the drama which lay in store, much of it revolving around the Fir Park keeper, Ally Maxwell, who went to collect a seemingly routine catch, only to clatter into United’s redoubtable John Clark. The thud reverberated around the stadium, but these were doughty individuals. A couple of dabs with the magic sponge would usually suffice for the afflicted, although it later emerged that Maxwell had lacerated his stomach and broken two ribs. Nowadays, play would have been suspended and stretchers would have appeared on the pitch. Back then, Maxwell had other, more pressing concerns to worry about than excruciating pain. For Cooper, this was a throwback to an earlier vintage and his attacks sparked panic in the United rearguard and left gaps elsewhere. When Dave Bowman served up a sparkling equaliser, it might have induced pangs of trepidation in lesser rivals, but Motherwell responded with the sort of high-class football which had defined their season and, as their supporters embarked on what subsequently proved to be premature celebrations, they surged 3-1 ahead. The first goal arrived when Cooper delivered a resplendent free kick from 30 yards out and the teenager, Phil O’Donnell, flung himself headlong into the melee to seize a memorable diving header. Then, with the Tayside personnel in the toils, the perennial substitute, Steve Kirk, laid on the service for Ian Angus to unleash a scintillating shot into the bottom corner. On most occasions, that would have been sufficient. But this was a extraordinary tussle between two indomitable sides. Despite their cushion, Motherwell were increasingly rocked by Maxwell’s travails: the keeper was in agony and, irrespective of his admirable perseverance, his incapacity allowed United a lifeline back into the match. John O’Neil launched their recovery when he stole in behind Luc Nijholt and powered a great header into the net. And then, as the decibel level threatened to blow the roof off the stadium, and with the contest advancing into injury time, a towering clearance from Alan Main found Darren Jackson with a sliver of space and he showed customary efficiency in levelling matters at three-apiece. It was a classic confrontation, encompassing old sweats and teenage wannabes, and, by this stage, Cooper admitted that he was feeling absolutely knackered. He needed extra time the way that Marvin Gaye needed soul, but this game was destined to tax everybody’s reserves, from the McLean brothers, Tommy and Jim, on either side of the managerial divide, to the thousands of supporters, who could hardly bear to watch, yet were engrossed. There was nothing those on the periphery could do. Motherwell’s followers reflected on how they had lost the Cup in similar circumstances, by failing to defend a two-goal advantage, back in 1931. United, for their part, were becoming so accustomed to self-destructing in these scenarios that their fanzine bore the name “The Final Hurdle”. Yet there was nothing to be ashamed about as the respective combatants flung themselves into the fray, above and beyond the call of duty. Steve Kirk forced a wonderful save from Main, but a couple of minutes later, a typically well-directed corner from Cooper provoked panic among the United players and Kirk, so often the hero on his team’s golden cup trail, stabbed the ball home from close range. Even at that juncture, with exhaustion seeping through the ranks of both collectives, Jim McLean’s personnel were unstinting in their efforts to find another goal. Maxwell, so clearly in the wars, denied Jackson heroically, then, as the second period of extra time raged on, United turned the screw even further, to the stage where even Cooper was forced into the role of manning the barricades. Nine times out of 10, or 99 out of 100, Maurice Malpas would have levelled the contest at 4-4, but his shot was parried way with remarkable fortitude by the ailing Maxwell, as the prelude to a last-gasp siege of the Motherwell ramparts. In the midst of the frenzy, Cooper was replaced by Colin O’Neill, but both sets of fans recognised the incredible shift which the veteran had offered his club and rose in acclaim as he hirpled off. And then, it was all over. Tom Boyd sought out Steve Kirk, Tommy McLean rushed over to check on the struggling Maxwell, and Davie Cooper dashed back on to the field as the victors enjoyed one of the most exhilarating experiences of their lives. “You never get tired of these days, and especially not when you are with a fantastic group of people,” said Cooper in the aftermath. Four years later, he was dead, at the tragically young age of 39. But he provided us with a string of indelible memories which will last as long as football itself.